Sinn stainless steel H-Link bracelet. Verified Owner Comments: This is a great watches that checks a lot of boxes: -Swiss movement (mine running < +6s / day) -Great vintage style -Brand indentiy/heritage -Robust construction for daily wear Before buying this, I hummed and hawed over making the extra jump (more like leap) for a Speedmaster - really glad I settled on this instead. Verified Owner Comments: Fantastic product and great customer service. All questions answered and personal phone call prior to shipping is a really nice touch. Shipping was lightning fast and item came as advertised and well packaged. Would recommend WatchBuys to anyone. 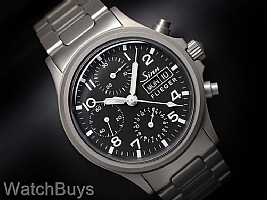 Verified Owner Comments: I have had my eye on the Sinn 356 for a few years, especially since I attended one of Watchbuys roadshows to see the model in person. The 356 is an extremely satisfying, high-quality piece of timekeeping art. The time is clear and legible, the chronograph functions perfectly without the size or clutter of a large (and unnecessary) tachometer bezel, and the fit and finish on the bracelet and case are absolutely fantastic. The build quality and reassuring weight really exceeded my expectations. The watchbuys folks were also extremely helpful and professional with me, both at the roadshow and on the phone and via e-mail. I would definitely purchase any future German timekeepers from them without hesitation. Verified Owner Comments: Love it. I was concerned that the diameter was smaller than i normally would consider, but the way it sits on wrist is perfect and beautiful. The case height and the crystal bubble give it a perfect presence, and I have a very large wrist. Design details over time become more appealing, like the arm extensions and the perfect proportions. Verified Owner Comments: This was my first experience purchasing from WatchBuys and it was as pleasant as others have reported. The follow call to confirm my order and shipment details was quick and courteous and any questions I had were answered. I will not hesitate to order from them again in the future. As for the watch, it was everything I expected and I have no complaints. Arrived very securely packed, in perfect condition, and with the time already set. The satin finished case and bracelet look great and the watch wears very comfortably. I am very glad I went with the acrylic crystal as the high dome adds a great deal of personality. I'm totally satisfied with the purchase. "Great watch at a great value." Verified Owner Comments: Very pleased. This model has a feel of what I think the 1960s Rolex sport models felt like out of the box new. Very good fit, finish, and comfort. A true tool watch at a great value. 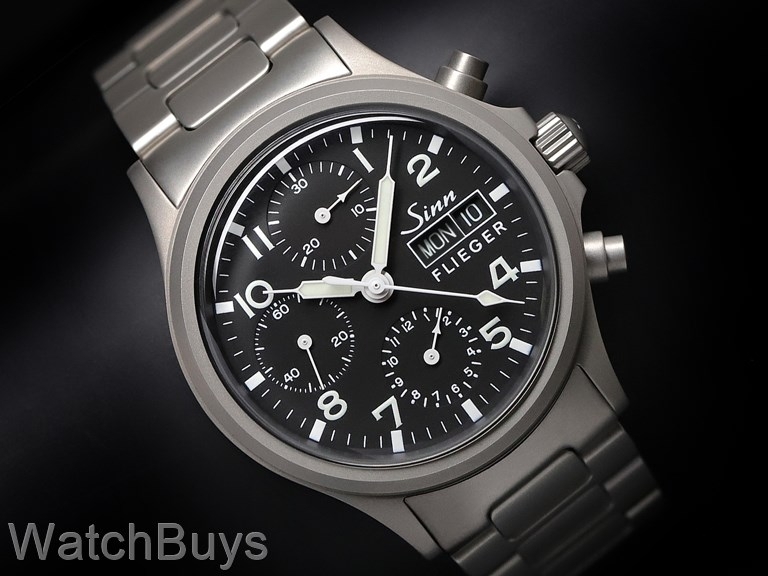 Verified Owner Comments: The Sinn 356 is one of the best looking if not perfect pilot style chronographs made today. At a respectable 38.5mm in diameter, it glides effortlessly under my dress shirt cuffs whether other Valjoux based 7750 watches have struggled. I was afraid the bead blasted finish of the bracelet would look too toolish with my business attire, but the watch looks right at home with my suits. By excluding the 3, 6, 9, and 12 o'clock numerals, Sinn was able to incorporate reasonably sized, legible subdials and at the same time not make the watch too crowded. Other little details like the glossy white luminous syringe hands, recessed dials, and arrow heads on the chronograph subdials makes this the perfect vintage style watch I have been looking for.